Clemson’s clueless—and filthy rich—champion coach represents everything wrong with college football. Something rotten wafted through the exhilarating, note-perfect college-football championship game between the Clemson Tigers and Alabama Crimson Tide, which ended with Clemson’s last second 35-31 upset victory. Two schools from the heart of Dixie. Two head coaches in Nick Saban and Dabo Swinney who make staggering sums of money. Two teams that are overwhelmingly African American and—in a move that might make past alumni spin in their graves—led by African-American quarterbacks. Two teams with defenses unafraid to unleash helmet-to-helmet hits against their opponents: hits that sent these “amateur” players into a sideline “tent” where they could be ministered to by school trainers away from prying eyes. Two teams whose rabid student sections were overwhelmingly, if not entirely, white, living vicariously through the violent exploits of their black classmates. These are also two schools where the history of the South hangs like a nightmare over the 21st-century campus. The University of Alabama’s past is a central chapter of the black freedom struggle in the United States. It’s where segregationist Governor George Wallace tried to physically block the university’s doors. And Clemson is built on the grounds of notorious Vice President John C. Calhoun’s plantation. Calhoun was perhaps this country’s most prominent 19th-century spokesperson for using African bodies as slave labor. There is also a building on campus, Tillman Hall, named after Benjamin Tillman, a proudly violent white supremacist, former senator, and someone who had a black state senator named Simon Coker assassinated in 1876. As Coker dropped to his knees, praying, Tillman stood over his body while two of his goons took Coker’s life. Students over the last several years have organized sit-ins in an effort to rename Tillman Hall. The struggle is ongoing. This history seems less like the distant past when we look at how lucrative these games have become. ESPN paid $7.3 billion dollars to broadcast the college-football playoffs. Athletes like Clemson quarterback Deshaun Watson clearly possess a marketable skill worth unfathomable amounts of money, especially compared to the last time Clemson won a national title in 1981. This changing reality is reflected in the salaries of the Clemson football coaches then and now. The head coach in 1981, Danny Ford made $50,000 that year (adjusted for inflation, that would be $140,000 today). 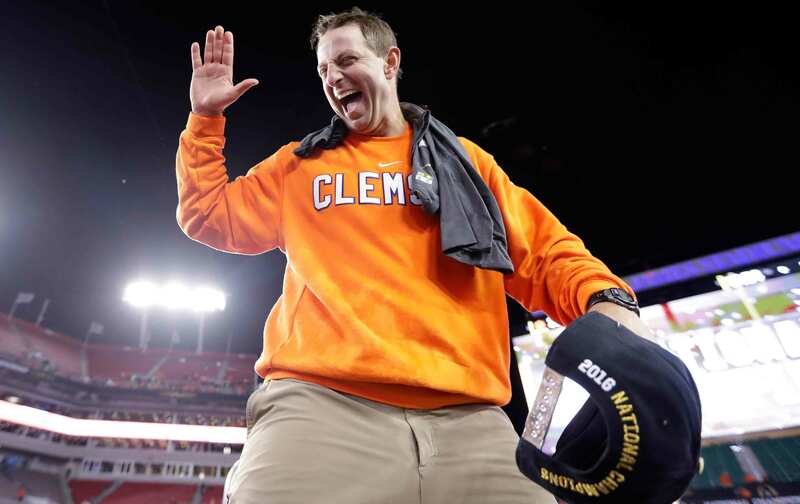 Dabo Swinney takes home a base salary of $4.55 million. He also made $1.4 million in bonuses for a total salary of just under $6 million. As for players, their lot in life is the same as in 1981, except now they receive a $388-a-month stipend. Swinney was asked about the idea of actually paying players, given the dramatically transformed economic landscape of the game, and he said that if players are ever paid, “I’ll go do something else because there’s enough entitlement in this world as there is.” To call the desire to end this rank exploitation “entitlement” is Orwellian in the extreme. He might as well write “War is peace. Freedom is slavery. Ignorance is strength.” on the locker-room walls. When asked about players’ protesting during the anthem, he said piously, “It’s so easy to say we have a race problem, but we got a sin problem.” He also stated that his players would be in trouble on his team for exercising this kind of dissent. I winced when I heard a reporter ask you, a white man who makes somewhere in the area of $5 million a year from the physical labor and bodily risk of unpaid black athletes, if he would ‘discipline’ them for making a political statement. Given that you and I both work on the former plantation of John C. Calhoun, the historical significance of the question is staggering and troubling. College football is a septic tank of entitlement. It’s a fungal culture created by the head coaches of Big Football. Dabo Swinney is the very embodiment of that culture: adrift, clueless, and filthy rich. Editor’s note: An earlier version of this post overstated the proportion of black players compared to white on each team. The majority of starting players on both teams are black.